“DON’T MESS WITH ME!” The karate student struck a pose to instill fear in the heart of the attacker–and couldn’t have made a worse mistake! What’s wrong with a pose? What’s wrong with trying to look deadly to an attacker? After all, many animals puff themselves up to look bigger than they are, and so put off an attack. Even the common house cat arches his back to look bigger. Why shouldn’t humans perform a similar action? To understand the flaw in posing for an attack one should examine the basic concepts behind forms training. When training in a form the student is moving, usually rapid fire, from technique to technique. Most people assume that the student is training to fight multiple opponents, and such an assumption would be quite erroneous. Yes, the forms are strings of techniques. And, yes, the forms can give one balance and strength and develop many other attributes. But the forms are more like a dictionary than a training method that should occupy a student’s major training efforts. 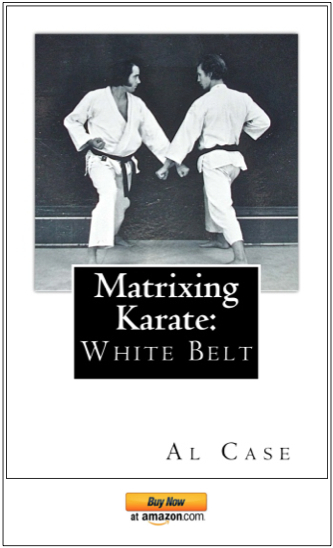 Forms training is actually a rather recent approach to martial arts training. Prior to the last couple of hundred years most martial arts training was done by studying techniques by doing them. Not by a rapid firing posing of them. Gichin Funakoshi is a major figure in this transition from technique to Form. Mr. Funakoshi utilized forms as a way to teach masses of school children the techniques of karate. To this day his methods are still in force, and thus the multitudes of people are being taught an art with grade school methods. To be sure, there is much to be gained by practicing forms. Just because they are a recent renovation doesn’t mean that one doesn’t gain certain benefits. And, of course, if one doesn’t have a partner to train with then forms are a good way of instilling technique into the muscular behavior. Many arts claim that the art is not an art without a study of forms to enhance it, and they are not entirely wrong. However, there are many arts which teach their techniques without extensive forms practice. Jujitsu, aikido, fencing, wrestling and boxing leap to the mind as fine examples. There are doubtless many UFC aficionados who hold this point. The most important reason for not striking poses prior to combat, to get to the point of this column, is because you let the attacker know that you know something. If the attacker is unstable enough to want to hurt you in the first place, he may not only not be put off by your pose, but may change the way he is attacking so that what you know will not effect him. He may get sneaky and try things that he normally wouldn’t have tried in combat. He could even step back, pull a gun and shoot you! So, striking a pose may be doing nothing more than giving your attacker knowledge of what you know, and setting yourself up as a target, a sitting duck, if you will. Also, and perhaps even more to the point, what are you doing striking a pose when you should be fighting? If you are posing and he is striking then you are going to get hit, and the outcome of a fight is often determined by the first strike!